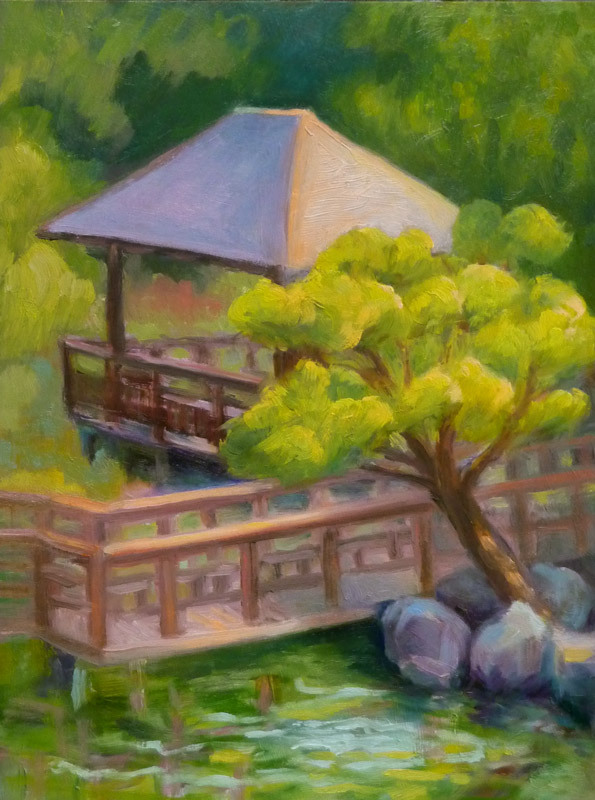 Hayward Japanese Garden (revised), oil on panel, 12x9"
Despite the encouragement to leave this painting and “don’t touch a thing” I wasn’t satisfied with it and made some adjustments to the color. I’m much happier with it now, although I wish my photo was more accurate. In real life the color is less fluorescent than it is appearing on the screen, although the actual scene in person was so brilliant it nearly was fluorescent. Previous Post: View of Mt. Tam from Rodeo, CA. Simplify. Big shapes. Color. Period. It’s definitely improved! The warmth in the sunlit areas, and especially the treatment of the reflection in the water. Beautiful! Beautful, Jana! I’ve been thinking a lot about you lately, must get in touch…..